IT´S really easy to make your own gravlax (pronounced grav-lox). 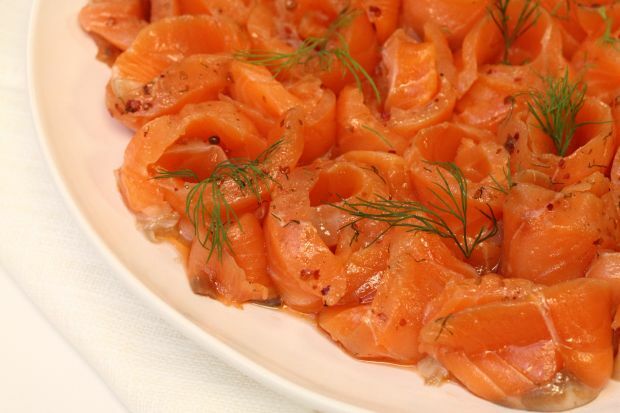 Unlike the old days in Scandinavia where the fish is buried in the ground and left to ferment for months – during which time it develops a strong odour – modern gravlax can be made in two days in the refrigerator and has a clean and fresh taste. The most efficient way to make gravlax is to use a whole salmon – place the two similarly-sized fillets against each other with the dill and the salt mix in between and covering the sides thickly. The finished gravlax has a briny (not salty) taste and a buttery, melt- in-your-mouth texture. The curing process will cause the fish to stiffen up a bit and turn it a vibrant vermillion. This recipe is the one I learnt from the French Culinary School in Asia. Remove any small bones from the fillets with a pair of tweezers. Combine the salt, sugar and crushed berries or peppercorns. Line a tray with cling film without cutting the film yet. Sprinkle the bottom of the tray generously with curing mix. Place a salmon fillet skin side down on the tray. Cover with a thick layer of curing mix. Place the dill on the salmon and place the other salmon fillet on top, skin side up. Cover with the remaining curing mix. Bring the cling film up and wrap the salmon well in several layers. Refrigerate for 24 hours. Flip over and refrigerate another 24 hours. To serve: Remove the dill and scrape off the salt; pat dry with a paper towel. Slice the gravlax thinly on the bias, leaving the skin behind. Serving suggestions: Serve gravlax as it is, with dill and lemon wedges, or with crème fraîche or sour cream, pickled onion and slices of hard-boiled egg, shrimps and salmon roe. Storage: Wrapped in plastic and refrigerated, gravlax will keep for three to four days. Tips: As a rough guide, for every 500g of salmon, allow 2 tablespoons (30g) salt, 1 tablespoon (30g) sugar and a bunch of dill. To cure smaller cuts of salmon, reduce the curing mix and time. A thin cut of salmon, or a cut weighing less than 500g, need only to be marinated for 12 hours. Test for doneness by tasting a small slice. Gravlax should not be overly salty – while the original purpose of salting raw salmon was to preserve it, today salt is only used as a seasoning. A longer cure will produce a stronger flavour and a drier texture.